GENEVA The civil war in Syria has forced over 2 million people out of the country and over 4 million others are displaced within its borders, making Syria the nation with the largest number of people torn from their homes right now, U.N. officials said Tuesday. "At this particular moment it's the highest number of displaced people anywhere in the world," he told reporters in Geneva. "Syria has become the great tragedy of this century  a disgraceful humanitarian calamity with suffering and displacement unparalleled in recent history." Almost 5,000 citizens a day on average are flowing out of Syria  a country of some 23 million people  many of them with little more than the clothes they are wearing, Guterres said. The number of refugees has surged by 1.8 million in just 12 months  up from almost 231,000 a year ago. 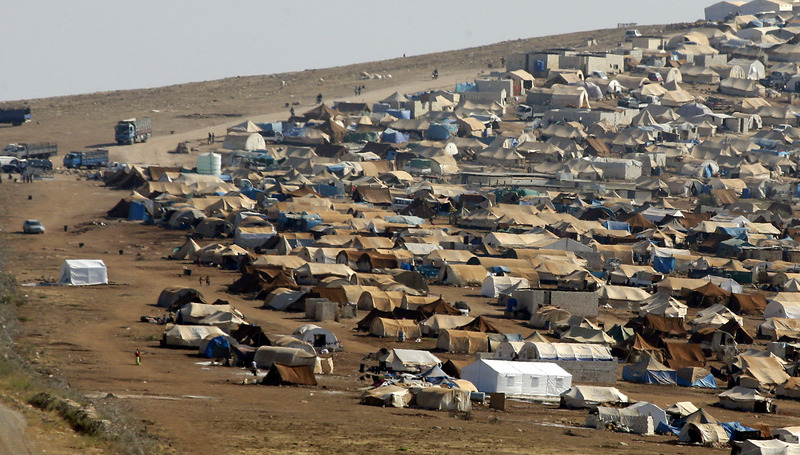 "What is appalling is that the first million fled Syria during two years. The second million fled Syria in (the past) six months," he said of the impact of the civil war, which began as a rebellion against President Bashar Assad's regime in March 2011. "We have now almost one-third of the Syria population that has been displaced, and half in need of assistance." More than 97 per cent of Syria's refugees are hosted by countries in the immediate surrounding region, which is impacting their infrastructures, economies and societies and making them in need of urgent outside help, Guterres said. "So there are no words to express the dimension of this tragedy," he said. "The only solace is the humanity shown by the neighboring countries in welcoming and saving the lives of so many refugees." As of the end of August, the agency counted 716,000 refugees in Lebanon, 515,000 in Jordan, 460,000 in Turkey, 168,000 in Iraq and 110,000 in Egypt. It said . That compares with Afghanistan's refugee crisis, whose numbers once rivaled Syria's, but has subsided somewhat with the repatriation of millions. Guterres noted that by comparison most Afghan refugees fled to two countries, Pakistan and Iran, each of which had populations far greater than the number of refugees they took in. Guterres told reporters in Geneva that the U.N. refugee agency has now counted more than 2 million refugees who have fled Syria's violence. Another 4.25 million people have been displaced within Syria, according to the U.N. Office for the Coordination of Humanitarian Affairs. However, the UNCHR representative in Syria, Tarik Kurdi, said on Monday that around 5 million people were displaced inside Syria. Asked about the discrepancy, Guterres said the 4.25 million figure is the official U.N. count; the Syrian government has estimated there are 5.1 million people displaced within the country. In August, Guterres warned there was an "enormous risk of Syria facing a lost generation," and he called the situation "totally unacceptable." "Even after they have crossed a border to safety, they are traumatized, depressed and in need of a reason for hope," he said. The threats to refugee children are rising, the agencies say, including child labor, early marriage and the potential for sexual exploitation and trafficking. More than 3,500 children in Jordan, Lebanon and Iraq have crossed Syria's borders unaccompanied or separated from their families, according to the U.N. figures. In May, CBS News correspondent Clarissa Ward traveled to a refugee camp in Jordan where Syrian parents were selling their daughters into marriage with wealthy Arab men in a desperate bid to survive. Ministers from Iraq, Jordan, Lebanon and Turkey were planning to meet with Guterres on Wednesday in Geneva in an effort to gain greater international support. "If the situation continues to deteriorate at this rate," said the U.N. special envoy for refugees, actress Angelina Jolie, "the number of refugees will only grow, and some neighboring countries could be brought to the point of collapse."